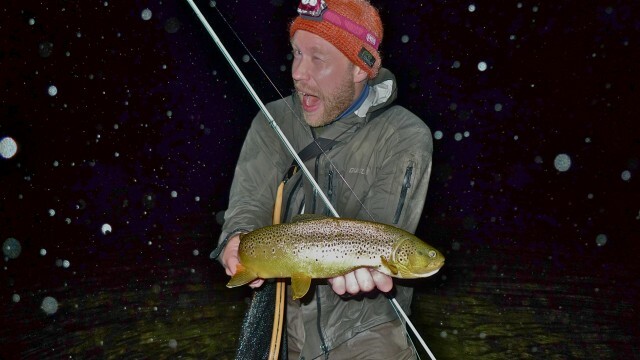 Ever since we started Jazz & Fly Fishing, I´ve been teasing the other guys in the band with a place called the X.
I´ve told them that the X is probably the best place in Scandinavia for big trout and big arctic char. From time to time, I´ve shown them blurry pictures of happy, non-J&FF fishing buddies of mine, posing in gorgeous wilderness surroundings with huge, stunningly beautiful fish in their arms and silly grins on their faces. Just to torment the guys. But I´ve never told the other J&FF guys where this El Dorado of fishing is located. They´ve tried all the tricks in the book to make me reveal the secret: They´ve gotten me really drunk (not difficult to accomplish), they´ve tried to bribe me (also doable), and they´ve threatened me with lawsuits and violence. But no. I´ve kept my mouth shut. Until now. Today, I have decided to share the dirty secret about the X. And not only with the guys in the band, but with the whole J&FF community. Here it goes: The X is not one single place – it´s a codeword for several different, secret places in the north of Scandinavia. Sorry Fredrik, Tapani and Joona, but that´s the truth. There is no such as thing as the X, just lots of Xs. The last few days, I´ve been checking out online maps a lot, trying to pinpoint the best possible locations for this summer´s J&FF expeditions. And what strikes me every time I look at a map of northern Scandinavia is how many fantastic fishing spots that still exist up there. So many Xs. And the magical summer above the arctic circle is on our doorstep. Life is beautiful. The pictures below are from a trip to one of these Xs in late August last year. Terje Storsten (a great bass player and J&FF friend who some of you might remember as the chef in this video), my cousin Dagfinn, and yours truly. One week of mountain fishing in a pristine wilderness area. Mostly very crappy weather, even for northern Scandinavia. Lots of gorgeous fish. One monster lost, leaving me with a bleeding cut in my leg after following it down the rapids. Lots of laughs. Cold and wet. Some big fish landed. Lots of mosquitos. Good food. Good times. Summer. Soon. Yep, this particular X is a really good place. That is Brilliant! ~ Cheers!